Sloan waterfree urinals reduce water and sewer costs, maintenance and repair bills, and create more hygienic, odor-free restrooms. A patented, sealed cartridge eliminates the need for water, typically conserving 40,000 gallons per unit per year. 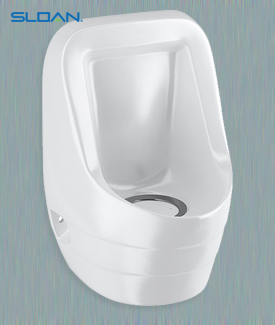 In addition, Sloan waterfree urinals do not require costly supply piping to fixture. The new wall-hung Sloan WES-4000 WaterFree Urinal with wall outlet saves you water and money. The WES-4000 eliminates water and sewer costs from urinals, reduces maintenance and repair bills, and creates hygienic, odor-free restrooms.